ตามข้อมูลของแอนดรูว์ นากอร์สกี (Andrew Nagorski) (2007; The Greatest Battle) อดอล์ฟ ฮิตเลอร์ได้ประกาศเจตนารมณ์ในการบุกครองสหภาพโซเวียตเมื่อวันที่ 11 สิงหาคม ค.ศ. 1939 ต่อคาร์ล ยาคอบ บูร์คฮาร์ดท์ ข้าหลวงสันนิบาตชาติ โดยกล่าวว่า "ทุกอย่างที่ผมทำมุ่งต่อต้านพวกรัสเซีย ถ้าทางตะวันตกโง่และตาบอดเกินกว่าจะฉวยสิ่งนี้ เช่นนั้นผมจะถูกบังคับให้หันไปทำความตกลงกับพวกรัสเซีย เอาชนะตะวันตก และจากนั้นหลังประเทศเหล่านั้นแพ้แล้ว ค่อยหันกำลังของผมทั้งหมดต่อสหภาพโซเวียต ผมต้องการยูเครนเพื่อที่เขาจะทำให้เราอดอยากไม่ได้ เหมือนที่เคยเกิดในสงครามครั้งที่แล้ว"
เมื่อวันที่ 8 กันยายน ปี ค.ศ. 1944 กองทัพแดงได้โจมตีที่ดักลา พาสบริเวณชายแดนระหว่างสโลวาเกีย-โปแลนด์.สองเดือนต่อมา,กองทัพโซเวียตได้รับชัยชนะและเคลื่อนทัพเข้าสู่สโลวาเกีย.จำนวนความเสียหายทั้งหมดสูงมาก:ทหารกองทัพแดงเสียชีวิตไป 2 หมื่นนาย,รวมทั้งเยอรมันหลายพันนาย,ชาวสโลวักและชาวเช็ก. ↑ Toomas Alatalu. Tuva. A State Reawakens. Soviet Studies, Vol. 44, No. 5 (1992), pp. 881-895. ↑ Mälksoo, Lauri (2003). 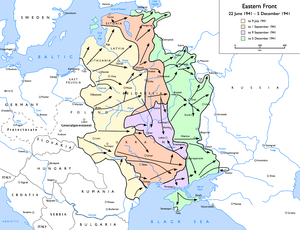 Illegal Annexation and State Continuity: The Case of the Incorporation of the Baltic States by the USSR. Leiden, Boston: Brill. ISBN 9041121773. ↑ revisions to translation by Dan Rogers. "The Wannsee Conference Protocol". source: John Mendelsohn, ed., _The Holocaust: Selected Documents in Eighteen Volumes._ Vol. 11: The Wannsee Protocol. Literature of the Holocaust, university of pennsylvania. สืบค้นเมื่อ 2009-01-05. ↑ Gerlach, Christian (1998). "The Wannsee Conference, the Fate of German Jews, and Hitler's Decision in Principle to Exterminate All European Jews". The Journal of Modern History. 70 (4): 759–812. doi:10.1086/235167. ↑ Bolloten, Burnett (1991). The Spanish Civil War: revolution and counterrevolution. University of North Carolina Press. p. 483. ISBN 0807819069. ↑ Zhukov, Georgy (1972). Vospominaniya i razmyshleniya. Moscow: Agenstvo pechati Novosti. ↑ David M. Glantz (2002). 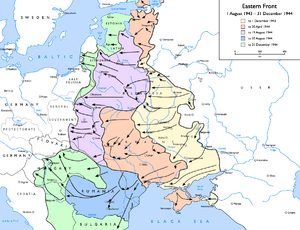 The Battle for Leningrad: 1941–1944. Lawrence: University Press of Kansas. ISBN 978-0-7006-1208-6. ↑ "The Otto Tief government and the fall of Tallinn". Estonian Ministry of Foreign Affairs. 2006. ↑ Ian Baxter (2009). Battle in the Baltics 1944–1945: the fighting for Latvia, Lithuania and Estonia: a photographic history. Solihull, West Midlands: Helion & Company Ltd.
↑ Estonian State Commission on Examination of Policies of Repression (2005). The White Book: Losses inflicted on the Estonian nation by occupation regimes. 1940–1991 (PDF). Estonian Encyclopedia Publishers. ↑ Toomas Hiio (1999). Combat in Estonia in 1944. In: Toomas Hiio, Meelis Maripuu, Indrek Paavle (Eds.). Estonia 1940–1945: Reports of the Estonian International Commission for the Investigation of Crimes Against Humanity. Tallinn. ↑ Khrivosheev 1997, pp. 219, 220. Antony Beevor, Artemis Cooper. 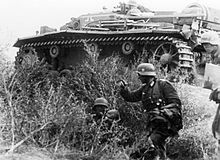 Stalingrad: The Fateful Siege: 1942-1943. New York: Penguin Books Ltd., 1998. ISBN 0140284583. Beevor, Antony. Berlin: The Downfall 1945. New York: Penguin Books Ltd., 2004. ISBN 0141017473. Erickson, John. The Road to Stalingrad. New York: Orion Publishing Group, Ltd., 2007. ISBN 0304365416. Erickson, John. The Road to Berlin. New York: Orion Publishing Group, Ltd., 2007. ISBN 978-0304365401. Erickson, John, and David Dilks. Barbarossa, the Axis and the Allies. Edinburgh: Edinburgh University Press, 1995. ISBN 0748605045. David Glantz, Jonathan M. House. When Titans Clashed: How the Red Army stopped Hitler. Lawrence, Kansas: University Press of Kansas, Reprint edition, 1998. ISBN 0700608990. Heinz Guderian. Panzer Leader, Da Capo Press Reissue edition. New York: Da Capo Press, 2001. ISBN 0-306-81101-4. David Irving. Hitler's War, Reissue edition. Avon Books, 1990. ISBN 0380758067. Basil Liddell Hart. 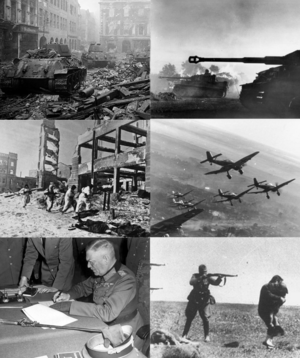 History of the Second World War. United States of America: De Capo Press, 1999. ISBN 0306809125. Müller, Rolf-Dieter and Gerd R. Ueberschär. 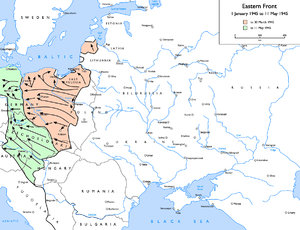 Hitler's War in the East, 1941-1945: A Critical Assessment. Berghahn Books, 1997. ISBN 1-57181-068-4. Richard Overy. Russia's War: A History of the Soviet Effort: 1941-1945, New Edition. New York: Penguin Books Ltd., 1998. ISBN 0140271694. Seaton, Albert. The Russo-German War, 1941-1945, Reprint edition. Presidio Press, 1993. ISBN 0891414916. F. W. Winterbotham. The Ultra Secret, New Edition. Orion Publishing Group Ltd., 2000. ISBN 0752837516. หน้านี้แก้ไขล่าสุดเมื่อวันที่ 18 เมษายน 2562 เวลา 01:07 น.